The benefits of collaborative learning are well documented—and yet, almost every teacher knows how group work can go wrong: restless students, unequal workloads, lack of accountability, and too little learning for all the effort involved. 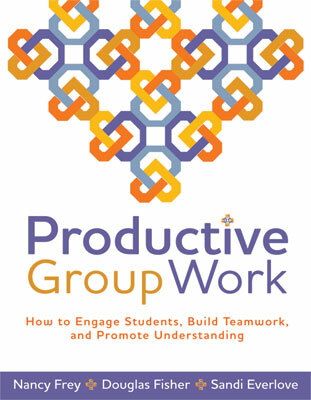 In this book, educators Nancy Frey, Douglas Fisher, and Sandi Everlove show you how to make all group work productive group work: with all students engaged in the academic content and with each other, building valuable social skills, consolidating and extending their knowledge, and increasing their readiness for independent learning. Foster essential interpersonal skills, such as thinking with clarity, listening, giving useful feedback, and considering different points of view. The authors also address the most frequently asked questions about group work, including the best ways to form groups, accommodate mixed readiness levels, and introduce collaborative learning routines into the classroom. Throughout, they build a case that productive group work is both an essential part of a gradual release of responsibility instructional model and a necessary part of good teaching practice. NANCY FREY, PhD is a professor of literacy in the School of Teacher Education at San Diego State University and a classroom teacher at Health Sciences High & Middle College. Before joining the university faculty, Nancy was a special education teacher in the Broward County (Florida) Public Schools, where she taught students at the elementary and middle school levels. She later worked for the Florida Department of Education on a statewide project for supporting students with disabilities in a general education curriculum. DOUGLAS FISHER, PhD is a professor of language and literacy education in the Department of Teacher Education at San Diego State University and a classroom teacher at Health Sciences High & Middle College. He is a member of the California Reading Hall of Fame and is the recipient of a Celebrate Literacy Award from the International Reading Association, the Farmer Award for Excellence in Writing from the National Council of Teachers of English, and a Christa McAuliffe Award for Excellence in Teacher Education from the American Association of State Colleges and Universities. SANDI EVERLOVE is the founder and chief academic officer at TeachFirst. She is the primary architect of a professional learning model that integrates online videos of research-based instructional practices, collaborative learning communities, leadership development, and onsite consulting. Prior to TeachFirst, Sandi was a high school chemistry teacher in Seattle Public Schools. She received the Washington State Golden Apple Award in 1998 and created an award-winning high school ethics course.